Traditionally the Dutch Shepherds were used to herd sheep, take them to market and keep them away from the crops. Aside from sheep they would gather cows at milking time and pull their milk carts. Today they are often used as police dogs, search and tracking, and as guide dogs for the blind in their homeland and other parts of Europe. The Wirehaired Dutch Shepherd has been herding sheep in Holland since at least the 18th century and are closely related to the Belgian Sheepdogs and the German Shepherd Dog. 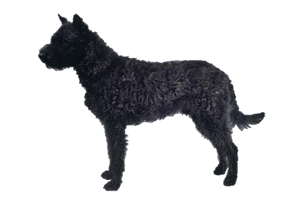 It is one of three different varieties (not breeds), the other two being the Longhaired and Shorthaired, which were divided at the end of the 20th century. This variety is believed to be the oldest of the three types and was once the most popular, although the Shorthair has now overshadowed it. All types were decimated after WWII and although breeding continued afterward there was a need to diversify the breeding pool. Some unknown dogs were used, but there are records indicating the Belgian Laekenois in particular was used to revitalize the Wirehaired. Is the Wirehaired Dutch Shepherd Right for You?